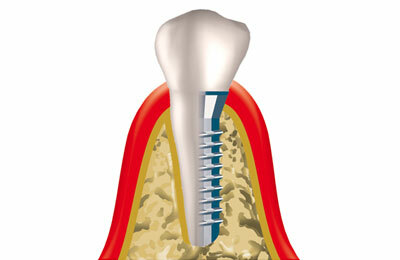 Implantation is the technologically sophisticated way to replace a lost tooth. It offers a high success rate with a beautiful aesthetic results. The implants are made from Titanium, a material which integrates natural to the body. The surgery is performed on an out-patient basis under local or general anesthesia. A dental implant is an excellent option for filling the gaps left by tooth loss or for closing large unattractive spaces in-between teeth. During the healing process, a solid foundation for your new tooth will be established. The dental implant acts as an artificial tooth root and provides a fixed and secure anchor for prosthetics, crowns, and bridges. The prosthetic tooth looks just like your other natural teeth. When considering implants, the advantages speak for themselves: a high degree of comfort, no chewing restrictions, and they feel and look natural.